By the time I finally got around to checking out this 1963 gem, I was already a full-fledged fan of its director, the great Akira Kurosawa. Some of his films, including The Seven Samurai and Rashomon, I ranked among the finest I’d ever seen, with Yojimbo, Ran, and Throne of Blood not far behind. What made this movie unique, however, was that it took place in the present, and didn’t contain a single Samurai. Yet, despite its modern-day setting, I found High and Low just as powerful as any the director’s historical outings. Kingo Gondo (Kurosawa regular Toshiro Mifune), an executive working for a shoe manufacturer, intends to buy up as many shares of his company as is needed to seize control of the entire organization. To that end, he’s mortgaged his home and gathered up as much money as he possibly could, but just as he’s finalizing the deal, tragedy strikes: a child is kidnapped. At first, the abducted boy is believed to be Gondo's son, Jun (Toshio Egi), but as it turns out, the kidnappers instead grabbed Shinichi (Masahiko Shimazu), the only child of Gondo’s chauffeur, Aiko (Yutaka Sada), by mistake. The ransom demanded for Shinichi’s safe return is 30 million yen, which is nearly all the money Gondo has scraped together. Reluctant to part with his cash, Gondo’s wife, Reiko (Kyoko Kagawa), pleads with him to reconsider, even if it means his financial ruin. The above situation is certainly enough to carry the film on its own, yet Kurosawa takes things a step further by also giving us the police investigation into the matter, with the authorities doing everything they can to apprehend the kidnappers. The second half of the movie goes into some incredible detail, showing us how the police piece together clues, and then tagging along as they follow up on them. Having spent a good deal of time at the outset exploring the moral dilemma his main character was facing, Kurosawa wraps things up with a thrilling manhunt that proves every bit as dramatic. 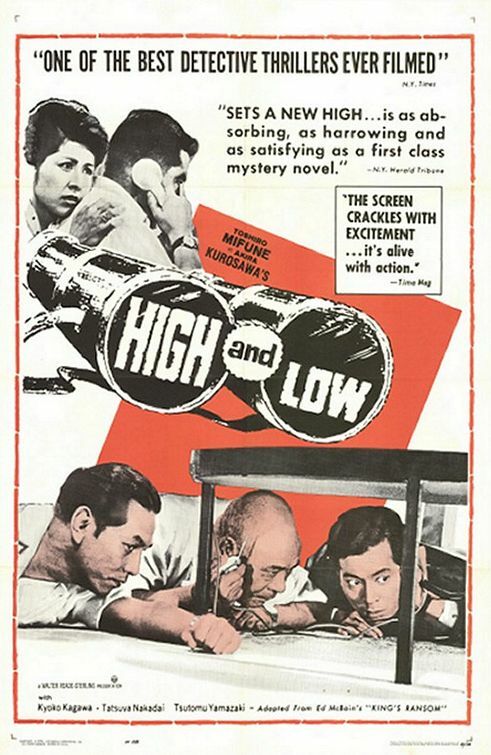 It may not have any Samurai or swordplay, but High and Low is, nonetheless, a wonderfully clever motion picture, with plenty of twists and turns to keep its audience guessing. Nice review! I'm a huge fan of Kurosawa too, so I'll have to check this out. I would recommend Ikiru as well, if you haven't seen it. Another Kurosawa movie without samurais, but also really good. @David: Thanks for the comment, and I'm glad you enjoyed the review! I have seen IKIRU, and I agree: it's a tremendous movie (better even than HIGH AND LOW). I'll definitely be adding that one to the blog somewhere down the road. I share the love to this great Japanese Director. Excellent movie, the 7 Samurai. Can't wait to watch this B/W "gem". Superb review as well.